Hi everyone……we are beyond excited to give you this most wonderful news!! 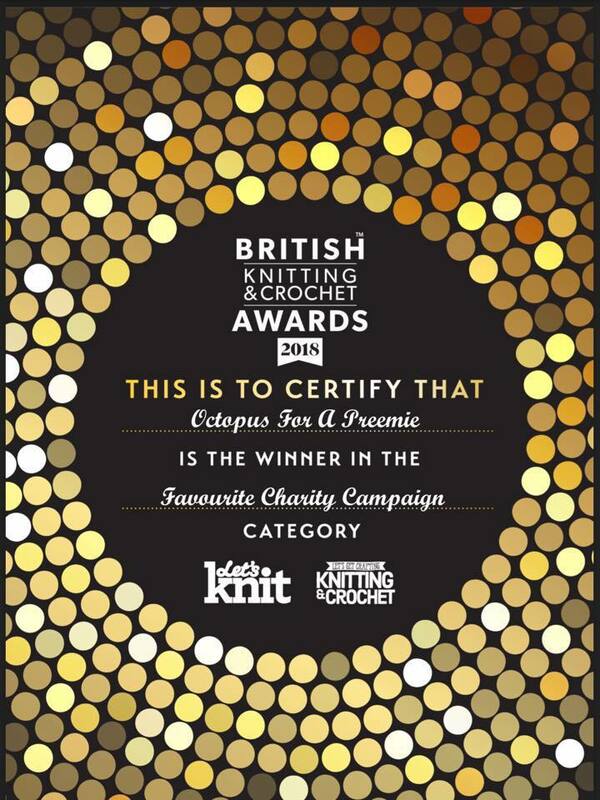 Octopus for a Preemie has won the charity category in the let’s knit award 2018! Thank you all so much for voting for us, believing in what we do and supporting us day in day out. Without all of you wonderful members we could not do this. So, this award is for you!! Please be very proud of what you have done and continue to do. Our love to each and every one of you. Please share with all of your friends…and those friends to share with their friends and so on. The Neonatal intensive care unit (NICU) at the Chelsea and Westminster Hospital have recently started introducing tightly crocheted octopuses for babies on the unit. These octopuses have proven to be a huge success with helping to stimulate babies as they are able to grasp them in their little hands. For parents, just to see your baby holding these little Octopuses and grasping at them is truly wonderful. Please can I ask if you know anybody that can crochet……mums, dads, aunties, uncles, nans, grandads, friends etc patterns for the preemie octopuses can be found on YouTube. Anybody that would be happy to donate any octopuses to ‘Luke’s Little Hands Appeal’ please follow the link below and state that you are donating the octopuses for ‘Luke’s Little Hands Appeal’. A team of volunteers who crochet toy octopuses for premature babies say they need more knitters to help. 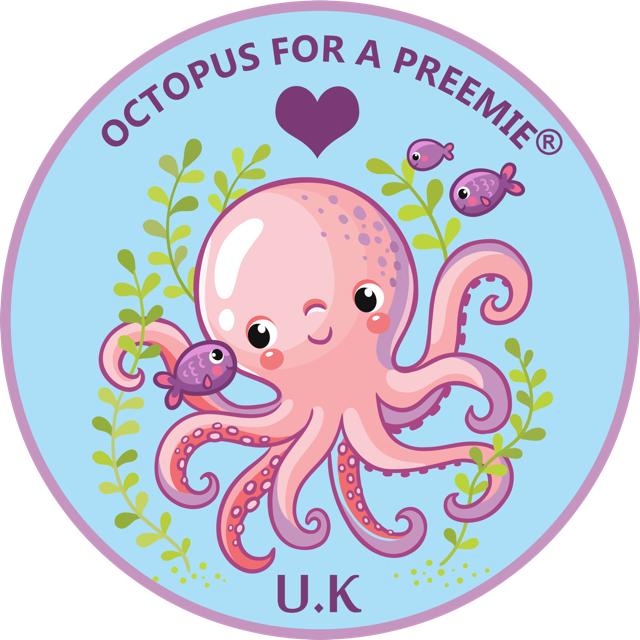 Octopus for a Preemie UK operates in premature baby units in 60 hospitals across the UK, including the West Midlands. The knitted octopuses' tentacles offer the premature babies something to cling to in place of an umbilical cord, as well as helping them to stop pulling out their tubes and wires. A team of volunteers who crochet toy octopuses for premature babies say they need more knitters to help. Octopus for a Preemie UK operates in premature baby units in 60 hospitals across the UK, including the West Midlands. The knitted octopuses’ tentacles offer the premature babies something to cling to in place of an umbilical cord, as well as helping them to stop pulling out their tubes and wires. Hobbycraft and other craft stores also have 100% cotton yarn and stuffing from our list and may offer discounts if you ask when you are buying the yarn. IF YOU HAVE MATERIALS WHICH HAVE NOT BEEN APPROVED YOU MUST CHECK WITH ADMIN OR COORDINATORS WHETHER THEY ARE OKAY TO USE AND MAY HAVE TO DO A STRAND TEST IN A WASH AT 60C AND SHOW THE RESULTS TO ADMIN OR COORDINATORS. We are delighted to announce that our fantastic Octo Ale is now ready to order. We decided to offer you all two gift set choices. And for those of you who would like to treat a family member who maybe isn’t into crocheting we have a 3 bottle of Octo Ale option without the tin or yarn. All orders and payment must be placed with Blind Monkey and the link it attached here below. Our story and details of how to contact us is on every box so what a great way to support our cause, spread the word and make that special someone in your life happy with a great gift!! !